Posted by Chris on Wednesday, May 30th, 2007, at 6:45 am, and filed under Dyeing. Wow, those are so gorgeous. 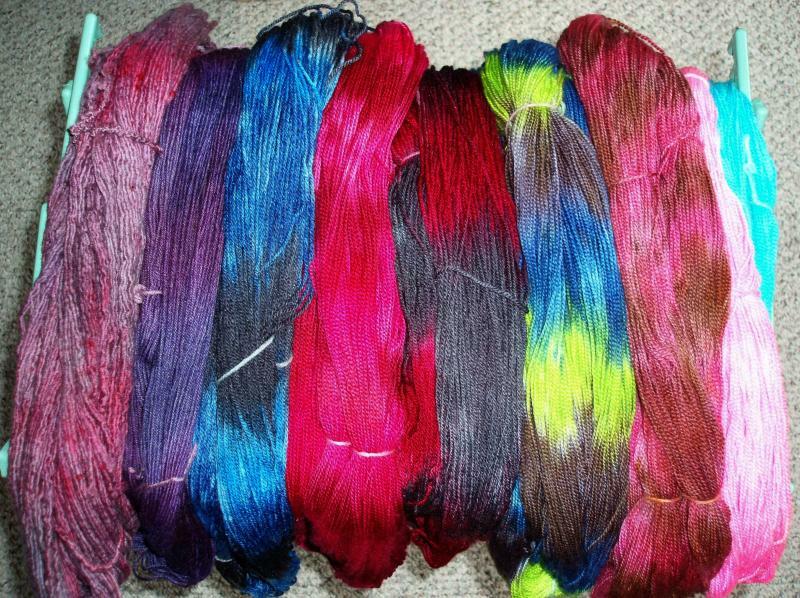 Some day I’m going to be able to tag along on dye day and see how this is all done. WAY outside your normal palette. I’m so proud! Oh, those are great! I love the pink and blue one, oh and the one with the lime green! They all look great. Ooo, I love the pink on more pink! How much? I need one of those in Zephyr! I’m sorry, but I’ll have to arm wrestle you for the pink-brown skein. Oh, but Chaos, those colors look simply smashing on you! Chris, beautiful, that’s really all I can say, simply beautiful. They are all lovely, perhaps Chaos wouldn’t mind modeling a few more reskeined? You really got such a great variety of colors. I think Chaos was hoping for something a little more masculine? Beautiful! I’m curious to see the pink and blue one, too. Ooo, blue and lime green, so pretty together. All the yarn is beautiful! I do like that pink and brown one. Your yarn turned out great! I like the pink & brown one a lot, though I usually don’t go in for that combo. Maybe it’s the furry prop that makes it, haha. Thanks for not posting the picture I didn’t see but surely don’t want posted. 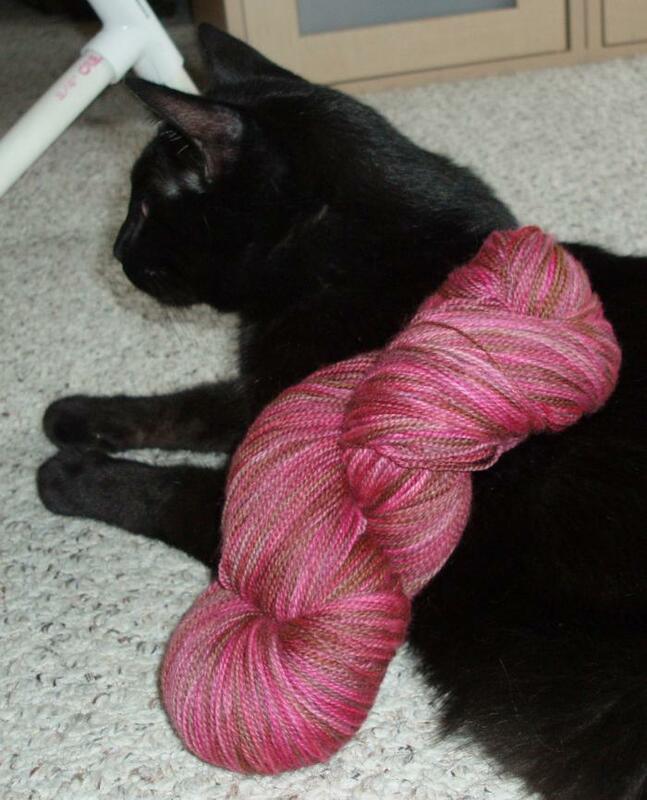 What do you mean when you say you’ve “re-skein” the yarn? Gorgeous, gorgeous yarn! 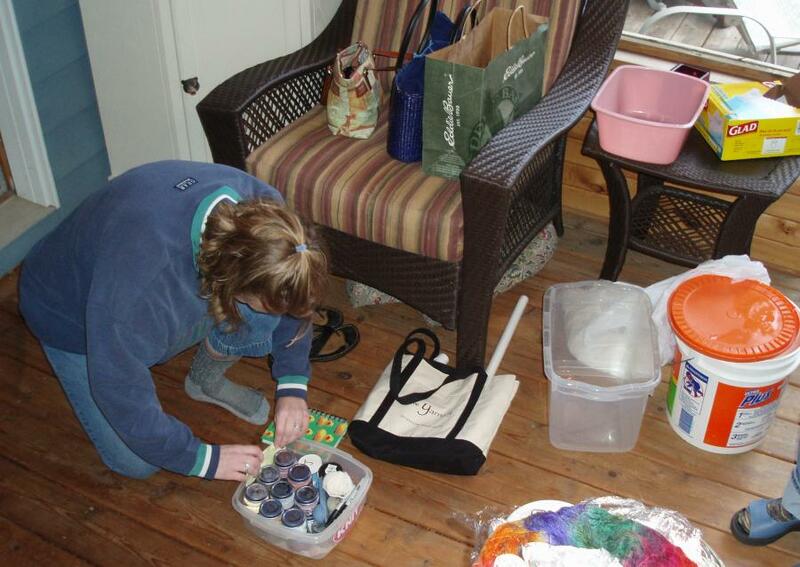 The yarn dyeing get togethers you have always look like so much fun! Awesome colors!! I’m intrigued by dying (and spinning)..but barely managing knit time right now so *must*resist*must*resist*….Love the burst of lime…very cool. I woke up this morning and didn’t know what the word reskeining meant. Now I do. I’m listening to Boxer right now, yet another strong suggestion – thanks! Chris- As far as music goes, I’m stuck between the 80’s and some sort of coffin/death music my son listens to. The yarn is awesome. And a huge pat on the back for going out of your comfort zone. 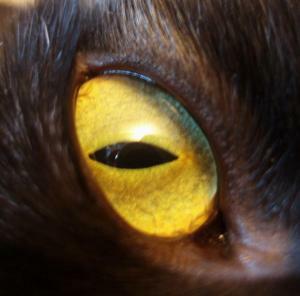 You see, there is a world beyond black and purple. The pink & brown is sooooo pretty! Can’t wait to see the others reskeined! All of the skeins turned out nice. Good dye job! I like the lime green skein and the red skein the best. 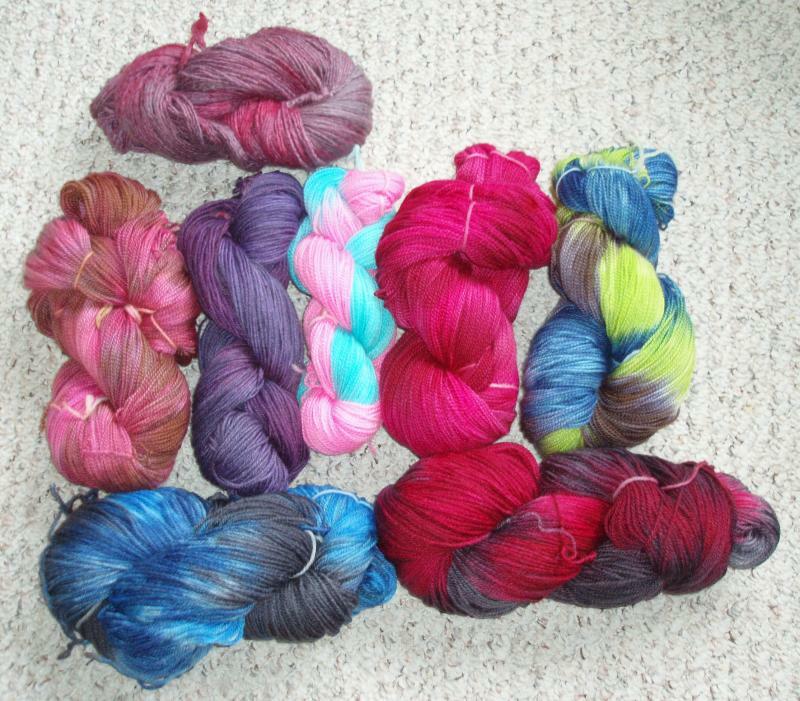 Is this the first time you dyed yarn? They came out great! What yarn did you use? What did you dye with? Beautiful! I particularly like the pink & brown. Beautiful yarn! I love the pink/brown one especially. I’m curious as to what sort of dye y’all used as well.. the colors are gorgeous! Oooo, the pink and brown look yummy! They all look great, really. Those’re gorgeous! What base yarn were y’all using? 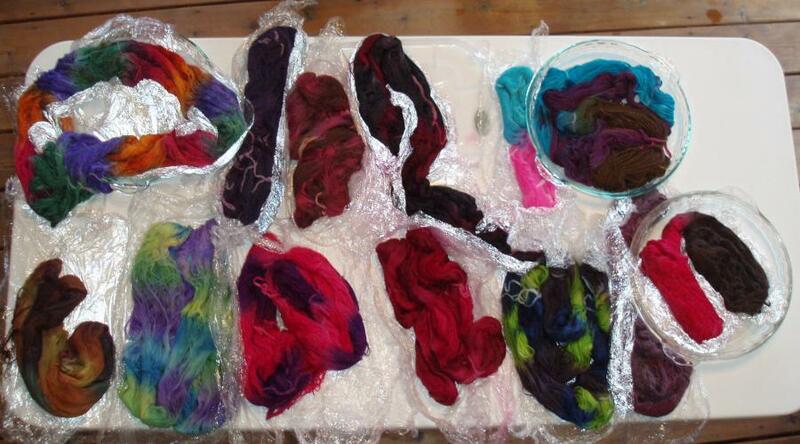 It looks like you had a great weekend — all those gluten-free treats and super dyeing! Love the pretty colors. 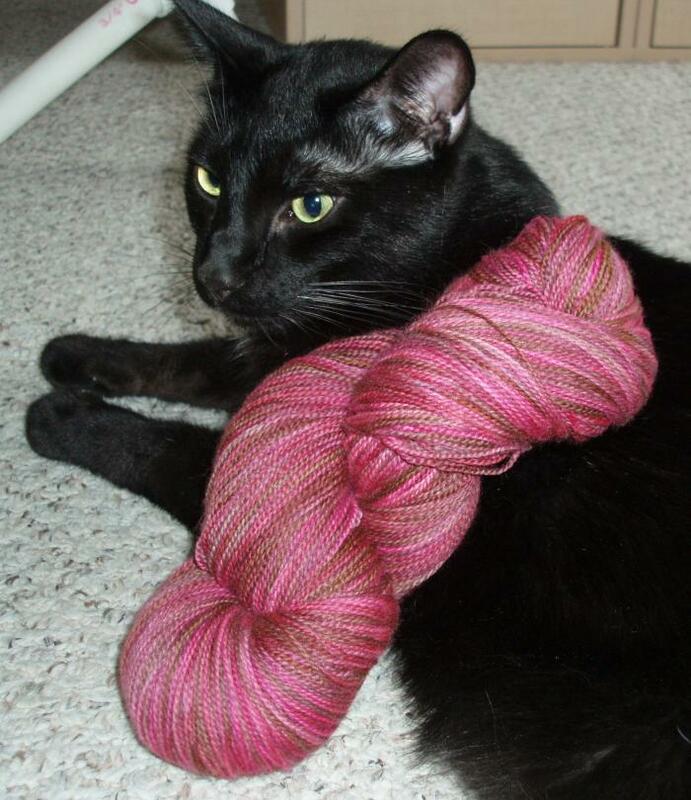 I personally think the pink and brown skein looks great with Chaos’ fur! Definitely his colors! I love that pink/red yarn in the middle! I need to find some dyeing buddies myself. I didn’t realize the swap was from Swap-bot (I didn’t see it under music swaps yesterday), so now I’m signed up! I have such a huge list that doesn’t correspond to your list that I’ve got to do it now! Great looking dye jobs!! Can’t wait to see some of them knit up! Oh, so pretty! And not all purple! No wonder Chaos was so taken aback. He’s a lovely model. Those handsome boys are so mooody though. That is some gorgeous yarn! I love the green and purple skein. WOW you and your dye friends have a great collection of colors. Do you co-op or does one person own them all? I bring Raspberry, Rosemary (not the cat) and Oak to our dye parties. Can’t wait to see what you do with the purple to a little pink skien. Wow! The colors of the yarn are beautiful! Pretty colors! The green-blue-purple one caught my eye immediately. : ) Chaos looks so disappointed, give him a treat! Wow! You’ve been very busy and those are gorgeous!! Wow those colors are fun, they appear very bright! those colors came out so vibrant. looks like lots of fun. « Iced java jacket pattern and Project Spectrum mix cd contest!